New mssql extension for Visual Studio Code: Get the free mssql extension from the VS Code marketplace and connect to SQL running anywhere, get IntelliSense and keyword completion while typing T-SQL queries, and run your queries to see results — all within Visual Studio Code and on Linux/macOS/Windows! New SQL command line tools for Linux: We’ve created Linux-native versions of your favorite SQL command line tools such as sqlcmd and bcp and sqlpackage and also added the new mssql-conf tool that lets you configure various properties for the SQL Server instance on Linux (e.g., SA password, TCP port and collation). 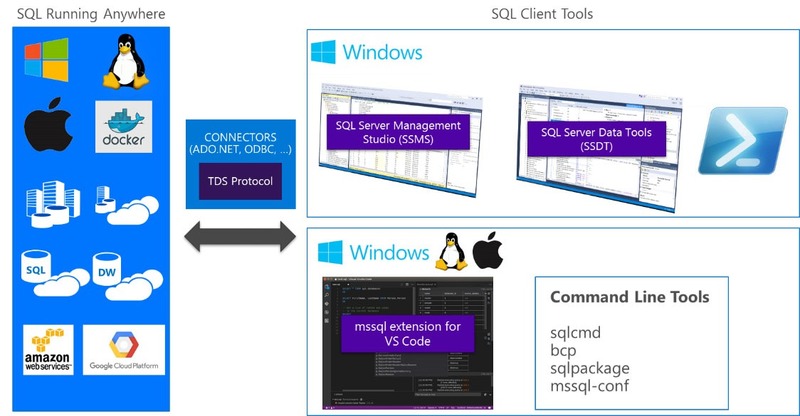 New versions of SSMS, SSDT and SQL PowerShell: We have released updated versions (v17.0 RC1) of our flagship SQL Server tools including SQL Server Management Studio (SSMS), Visual Studio SQL Server Data Tools (SSDT) and SQL PowerShell with support for the SQL Server v.Next on Windows and Linux. The picture below summarizes the expanded SQL tools portfolio with these announcements. Going forward, we plan to continue our close collaboration with customers and the broader SQL community to enhance our SQL tools portfolio and incrementally create multiplatform SQL tools for developers and database administrators. Take a look at the source code for the mssql extension on github and submit your ideas and pull requests!